But in sites in and around what is now Peru, treasure troves of amazing textiles have been found that are thousands of years old—predating even the Incas. Including very beautiful and intricate braids! These textiles were usually found wrapped around mummified human remains. The mummies were carefully buried in sitting position and swathed with layers and layers of rich textiles. The extreme dryness of the climate more than anything else is what preserved both the textiles and the human remains. 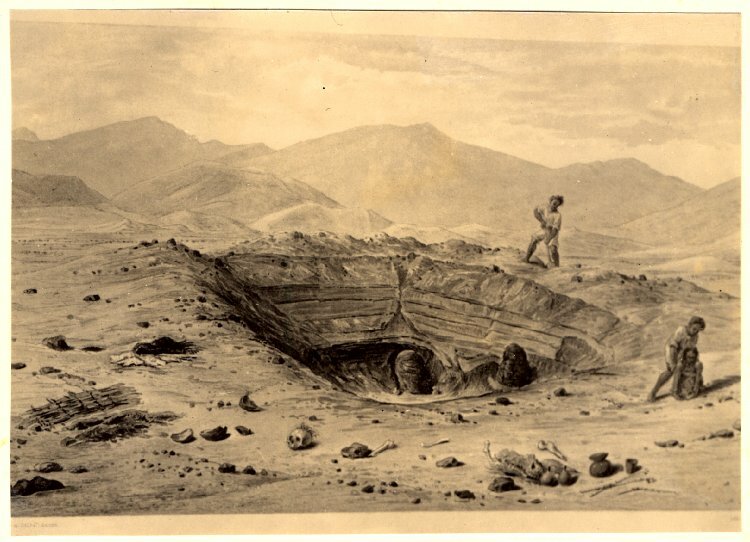 The people of these burials had societies that included specialized artisans. 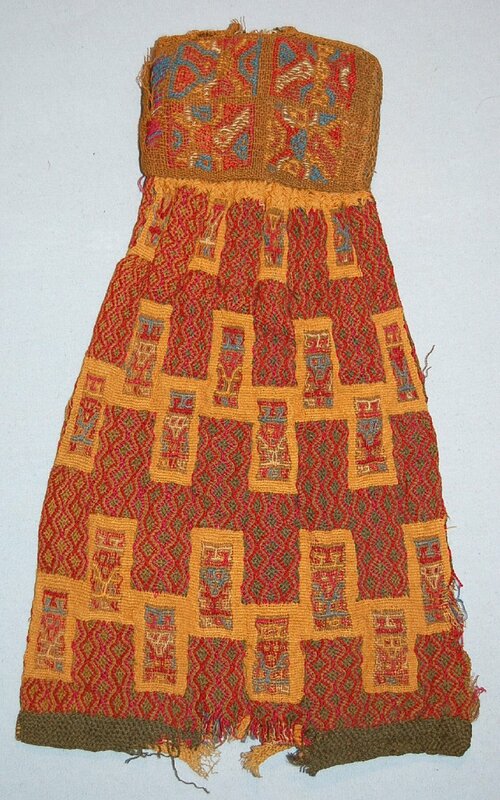 Textiles seem to be the main way wealth and status were expressed. Rodrick is probably most well-known for his instructional kumihimo (Japanese braiding) dvds and 2 seminal kumihimo books: Braids: 250 Patterns from Japan, Peru, and Beyond —on Marudai braids, and Making Kumihimo —on Takadai braids, the main English-language reference for braiding on a Takadai. 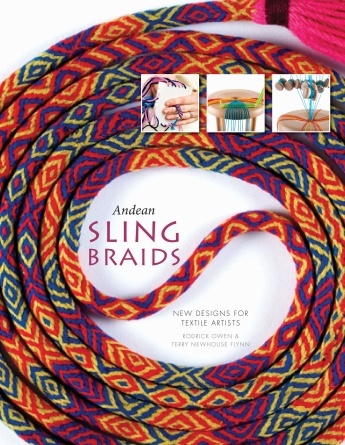 His soon-to-be-released collaboration with Terry Flynn is a book called Andean Sling Braids, on yet another Andean braid tradition. Only in Rodrick’s workshops or lectures do you find out about his equally impressive, unpublished research in analyzing and recreating ancient flat pre-Incan braids. 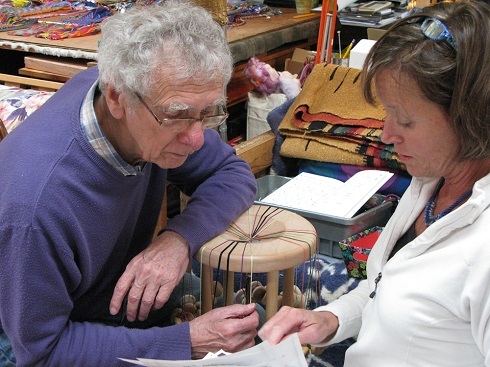 This has been a passion of his for over 40 years. Before I had even seen how beautiful these Andean braids are, what really excited me about them was finding out that the originals were probably loop braided! I had already signed up for Rodrick’s workshop when I found this out, and I still remember how blown-away I was—I couldn’t believe the coincidence. It seemed as if everything in braiding kept coming back to loops! 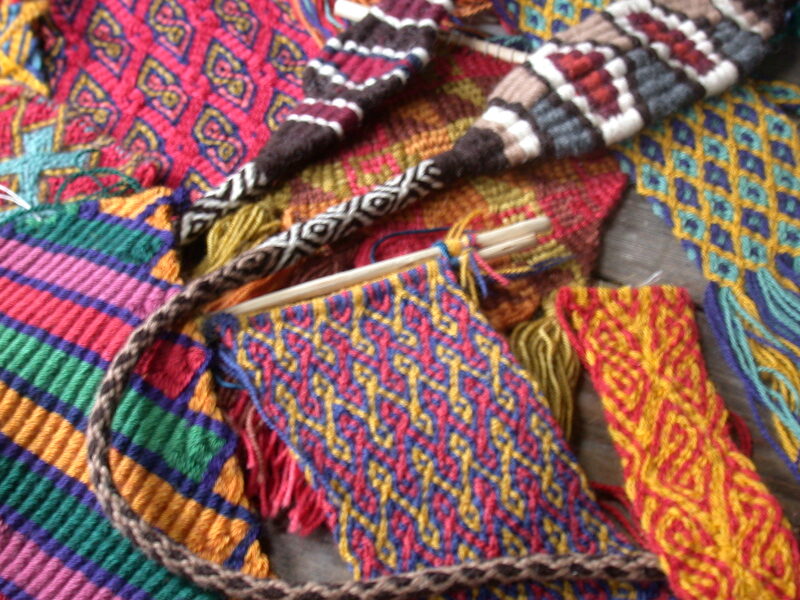 More class samples of Rodrick’s Andean flat braid reconstructions, plus two sling braids with woven ‘cradles’. More of Rodrick Owen’s Andean flat braid recreations, plus two slings. The bold-patterned repp-like braid at the lower left was done with single course oblique twining (SCOT)(sorry, I was wrong about this!!! Rodrick now tells me this repp piece was done in plain weave, as were the original Peruvian braids he based his on), and a color-manipulation technique I’ve been calling color-linking, here for instance to keep the yellow color of the right edge from migrating across the whole braid. In contrast to the strictly standardized Kara-kumi sashes [Japanese twined braids], in Peruvian [braids] the possibilities for ornamental patterning … are exploited to an incredible extent, by applying all kinds of novel tricks. Detail of one of Rodrick Owen’s reproductions. This braid incorporates a very novel trick! There are six alternating colors in each multicolor path of traveling threads, on both faces of the braid. 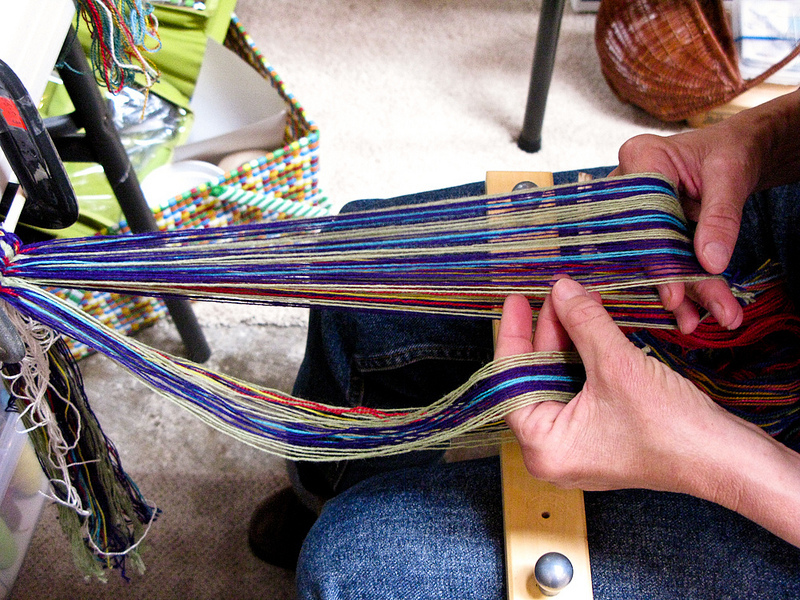 Only two alternating colors ought to be possible in a flat, twined braid! as in my gold and blue braid two photos down. (Use bicolor loops for the 2 alternating colors within a column.) How did they do it??? Until Rodrick showed me the solution, this seemed completely impossible to me! These braiders also used their ingenuity to create amazing geometric, and even representational patterns. Below is a reproduction of a museum specimen with motifs that may be birds heads and entwined serpents. These were common and probably highly significant motifs in pre-columbian textiles. This braid was made by Nora Rogers, a friend and colleague of Rodrick’s, and an inspiration to me and many other braiders and textile artists. Andean braid reproduction. Original is in the Textile Museum, registration no. 1965.40.19. Braid and photo © Nora Rogers. When the two threads of a twining pair are two different colors, those two colors will alternate on each face of the braid, changing each time the pair is twined. This braid was loosely based on one of Rodrick’s braids, but I added the bicolor sections and may have changed the design a little. That was just a slight variation, but these techniques could potentially be used in very different ways than they were by their originators… One of Rodrick’s braids in the first group braid photo is an original interpretation using Andean techniques, but colors and shade gradations that I don’t think of as Andean at all in style. In the past, Rodrick has even created large-scale braided art installations using some of these Andean braid structures—art pieces that apparently looked nothing like the braids that inspired them. Rodrick Owen’s long-term dedication, commitment and ingenuity in researching, learning, and teaching others this incredible and ancient braiding tradition is truly awe-inspiring! I feel very lucky that I have been able to learn from him. I almost fell over with shock when I read that email! I had been loop braiding avidly for a couple of years by then, and had signed up for Rodrick’s workshop to learn more about braiding in general. I knew he was a famous braider, and my friend Anne, who had taken his workshops, told me that besides kumihimo, Rodrick also taught “Peruvian braids,” which were made by hand, not on braiding stands. That sounded really interesting to me, but I certainly didn’t expect it would have anything directly to do with loop braiding. 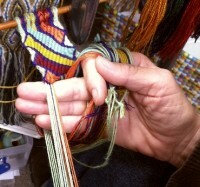 A method for producing single-course oblique twining in sections, with HAND HELD rather than finger-held loops, was suggested independently by Mary Frame for old Peruvian, and Masa Kinoshita for old Japanese braids. Many indications support the hypothesis in both cases. OMG! I had heard of hand-held loops in reference to ancient Japanese loop braiding (kute-uchi) from Masa(ko) Kinoshita’s site LMBRIC. But hand-held loop braiding for “old Peruvian braids”?!! Who was Mary Frame? And what were these old Peruvian braids, anyway? I couldn’t find any images online, just references to sling braids, which Anne had told me were completely different from the flat braids Rodrick taught. As it turned out, we did almost no SCOT type twining in Rodrick’s workshop. The first type of braiding he taught was something he called “counter-twining,” which was very common in Andean braids. Using free ends (not loops) to braid this counter twining structure means braiding with increments of four threads. Each of the four threads in a group has to be manipulated in a specific way each time one group of four threads crosses another group of four threads. 62 hand-held loops, wool. (not the same braid as in the 2 photos below.) Photo by Michael Hattori (detail). Rodrick also showed how the same counter-twined structure could be made with hand-held loops! When I tried this, the braiding moves felt more efficient, there was no fussing over which strand was which, and there were (effectively) half the number of threads to keep track of. Plus, the braid was easier to tighten. 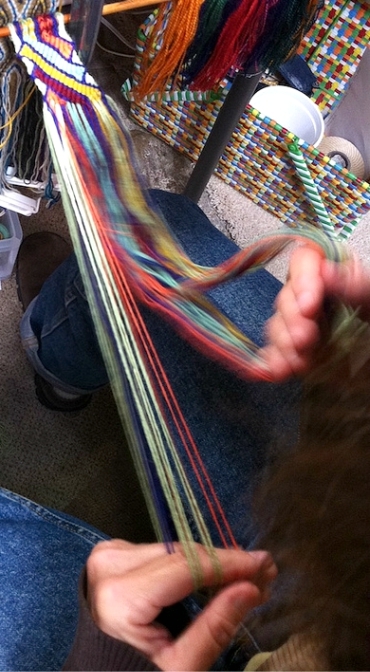 Braiding [oblique twining], hand-held loops. Photo by Michael Hattori (detail). I tighten Andean-type hand-held loop braids by holding all the loops of the most recent braiding move(s) together on the same hand, and then beating their fell with the other hand. This is much more effective than trying to tighten by spreading those loops apart. Photo by Michael Hattori (detail). 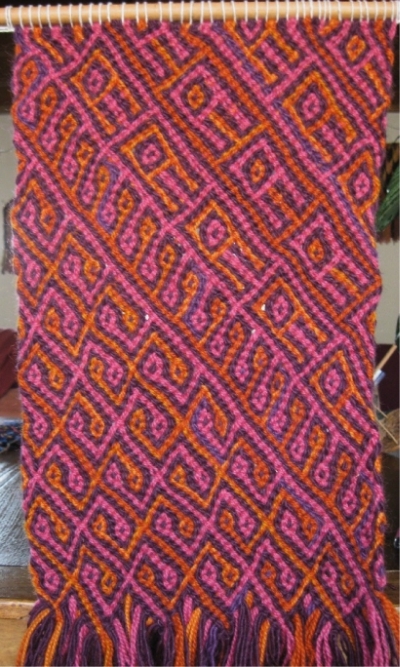 I found out from Rodrick that Mary Frame is an authority on ancient Andean textiles who realized that hand-held loop braiding must have been the method for most old Andean braids. As a loop braider with no previous knowledge of ancient Andean textiles, I’ve found in Rodrick’s workshops that these braids feel very natural to make with loop braiding. When Rodrick found out about Mary Frame’s loop braiding hypothesis for ancient Andean braids, he had already been recreating these braids for decades using free-end braiding techniques. (He may not have been as overjoyed as I was to find out that the originals had been braided with loops!) Since then, he’s been making them both ways. She was quite specific later, in Old English Pattern Books, citing Mary Frame’s well-founded hypothesis that old Peruvian braids were made by loop braiding. I can’t quite understand why she skirted around this in her Manual, unless out of academic politeness—perhaps not wanting to reveal another researchers’ work before the researcher herself publishes it? [It] is infinitely laborious and time-consuming. Whoever has tried even a small sample…will know this, and he will profoundly admire Peruvian specimens of great lengths, worked impeccably with large quantities of finest yarn. Even when using loops, it definitely takes time to accomplish a decent length of these braids. But I find it much faster than working with all loose ends. And there is a pleasant, relaxed feel to the braiding, a nice rhythm of production. Another inherent advantage to loop braiding is that it’s no more difficult to braid with fine threads than thick ones. The manipulation of the threads is done nearer to the ends of the loops, where, practically speaking, they are essentially the size of one’s hand, regardless of the actual thickness of the thread. When working with large numbers of loops, fine threads are actually easier to handle than thick ones, because you can fit more of them in one hand. *1. Other, non-braided textiles of these cultures included weavings, sprang, twining, cross-knit looping (this has also been called “single-needle knitting”—a type of looping often included in the category of naalbinding—in ancient Peru this technique was used among other things to make incredibly detailed 3-D/ bas-relief textile figures), weft-wrapping, painted textiles, and more, all very finely-detailed and colorful. It’s easier to find images of the weavings and bas-relief looped work than of the braids. *2. Unless you have access to certain museums, the main/ only way I know of that you can see full-color images of these amazing ancient braids is at one of Rodrick’s slide presentations. He has visited museums all over the world to examine and photograph their Andean braid collections as part of his ongoing research in reconstructing them. Unfortunately I can’t post his museum photos here on my blog—museums have stringent copyright restrictions on their images. The only good braid images that I have found online are a few that the British Museum has made available on their public website, with broader copyrights that permit reproduction for “own use,” and sharing online etc for non-commercial educational use. Here’s one of them, half of the fabric of this ‘pendant’ was woven, and the other half was braided—simultaneously! The other areas are braided. The braided and the woven sections were somehow constructed together as one piece! The museum description states that it is a “single piece of double layer camelid braiding and warp-faced plain weave”. If you go to “other views” in the museum link (click on the museum item number under the image), you can see that the front and the back have reversed braided and woven areas. Rodrick told me that Adele Cahlander described this or a very similar pendant in one of her books. When I find that reference I will add it to my resources list above. *3. Usually of very finely-spun camelid fiber, meaning wool from a llama, alpaca, or vicuna-type animal. This wasn’t their only fiber source, they also made textiles from cotton and agave-type fibers. Weavings often had a cotton warp, and camelid wool weft. *4. Sling braids are thick, usually square-shaped and often magnificently patterned. 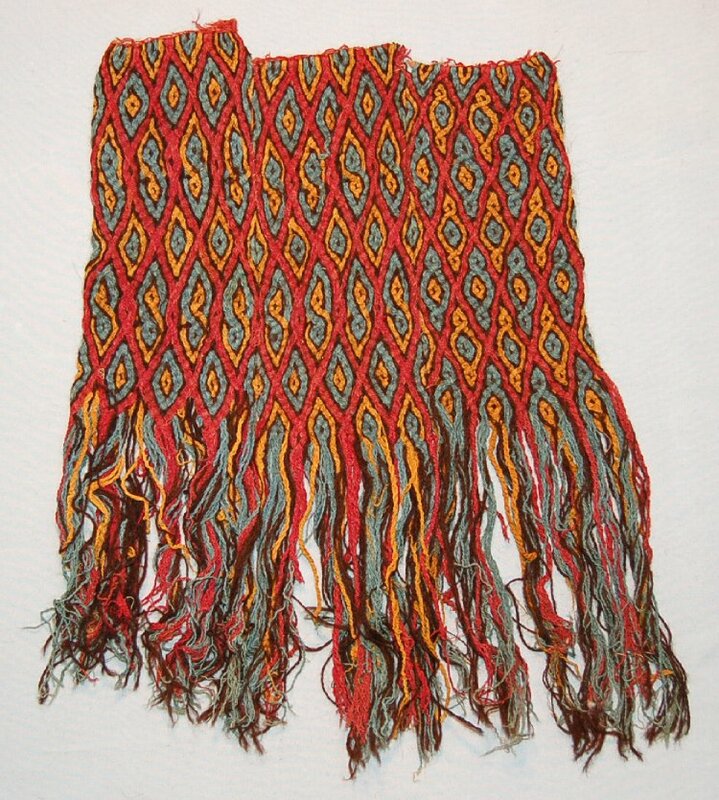 These were also present in burial sites of pre-Incan cultures, but unlike the flat braids, they are still a traditional textile in Peru and Bolivia. They are made by a very different technique than the flat braids. Sling braids can be braided in the traditional manner (“on the fist” with no equipment); on a card with slots; on a murudai; or on a specialized braiding stand called a core-frame, recently developed by Rodrick Owen and made by BraidersHand. The core-frame is an add-on to a marudai, specifically for those sling braid patterns in which a core of supplemental colors are carried hidden inside the braid and brought out at the discretion of the braider (who swaps them with other colors that are sent back into the core). If a hidden core of colors is used, the surface pattern of the braid can have dramatic color changes that are not possible with most braiding methods. The book has patterns for over a hundred beautiful braids! These include patterns that require a hidden ‘core’ of extra colors, as well as patterns that don’t require a core of extra colors. Braiders in Rodrick’s workshops have been making them as thick, authentic sling-type braids, down to fine jewelry-type braids. Other than taking one of Rodrick’s workshops or seeing his slide presentations, the only sources of information that I know of on these braids are the books and museums below. The books have interesting information, but unfortunately, none have high quality photos. Searching for online museum images is the best bet for good quality images. Currently only a few of these Pre-Incan braids come up in my searches, but museums are adding images of their collections online all the time, so there may be more in the future. Museums may not know to label these as “braids”, so good search words to use would be various combinations of the following: textile, Pre-Columbian, Nazca, Nasca, Paracas, plait, headband, turban (these braids have occasionally been called “turban braids”), braided, camelid, Peru, etc. Mary Frame is an expert on South American textiles, and was the first to realize these ancient Peruvian braids had been made with loop braiding. She has published some fascinating scholarly articles on social and other aspects of Andean textiles. 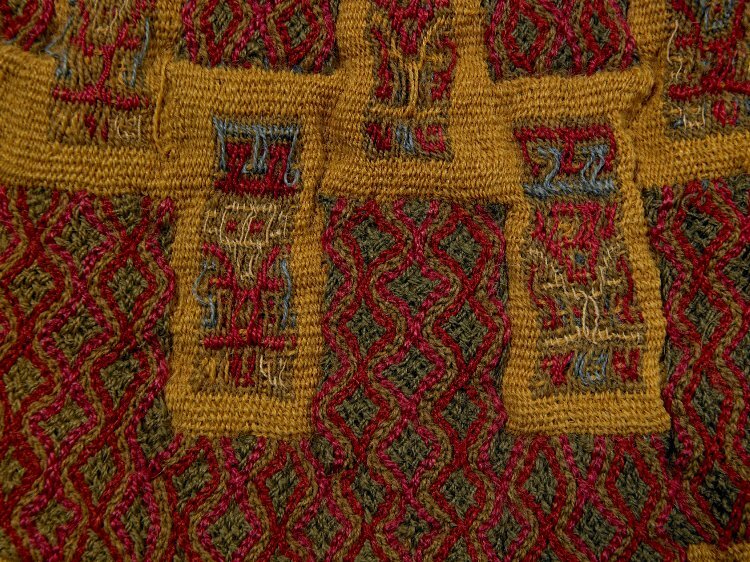 Raoul d’Harcourt, Textiles of Ancient Peru and Their Techniques, 1934, republished in paperback in 1974 and 1987. Classic book. D’Harcourt describes the structures of several braids (also called plaits) among many other textile techniques, with black and white diagrams supplementing the text, and grainy black and white photos in the “Plates” section. No mention of loop braiding. (I have been warned that a few of d’Harcourt’s diagrams and descriptions have some inaccuracies.) Interesting resource for all kinds of textile techniques and ideas besides braiding—embroidery, weaving, looping (not as a braiding technique), edging/ finishing, more. Peruvian braids start in Ch.3 (p.25) but aren’t limited to that chapter. See also Ch.6 pp 40-41, and possibly elsewhere. Noémi Speiser, Old English Pattern Books for Loop Braiding, p 77. One page of instructions with clearly-drawn illustrations showing how to make a hand-held loop braid of simple single course oblique twining. Good intro to hand-held loop braiding, of a Peruvian and Kute-Uchi type quite different from the one in my Kute-Uchi tutorial on this blog. An old classic. 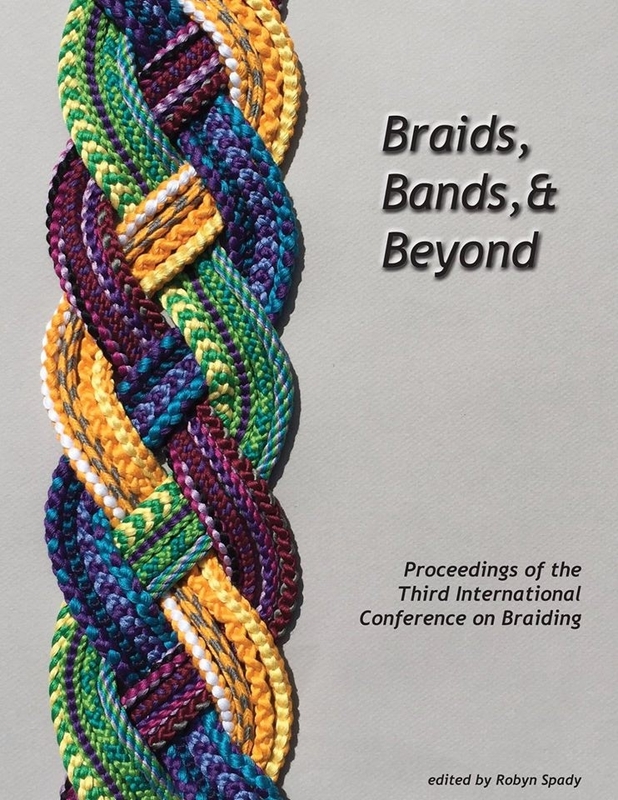 Small, almost pamphlet-size how-to book on both North American ‘fingerweaving’ style braiding, and simple Peruvian style braiding done with free ends. This book was Rodrick’s first introduction to these braids. Here’s a link to Franco’s blogpost showing a page and a project from the book. 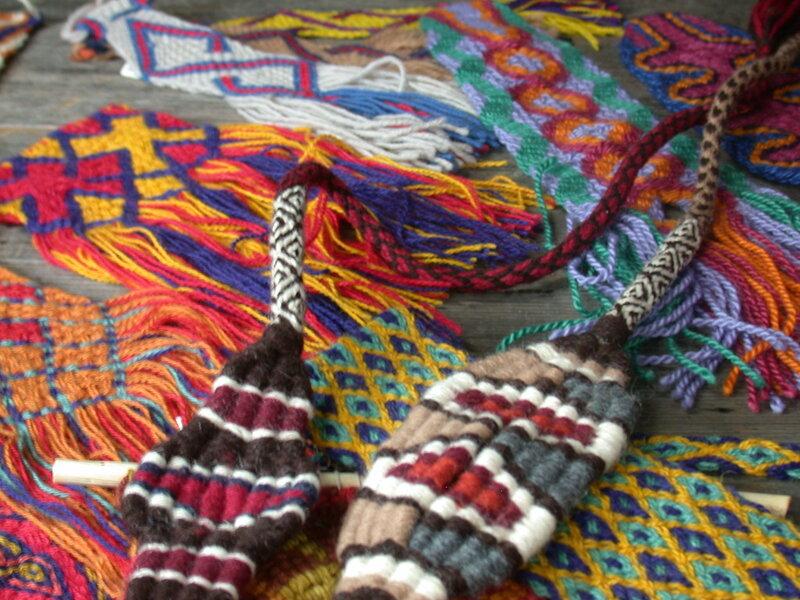 Adele Cahlander wrote about many different aspects of South American textiles. I don’t know yet which of her works include references to these braids, will update this when I know more. Museums don’t keep all their collections on permanent display. To see their pre-Incan braided textiles, you may have to contact the museum well ahead of time to arrange a private viewing. 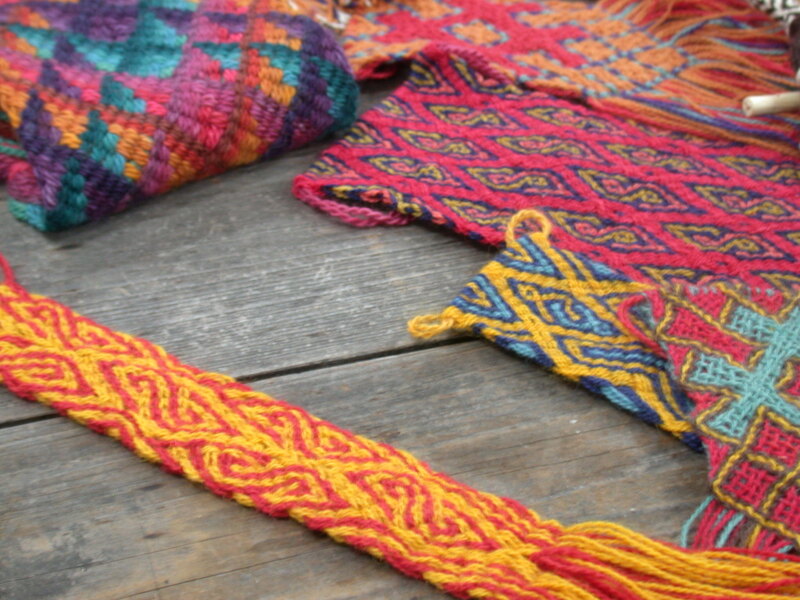 Flat, braided textiles were produced by several pre-Incan Andean cultures. They disappeared by the time of the Incan Empire, though sling braiding has survived to the present. Here’s a clear, succinct timeline of the cultures that preceded the Incan conquest. (On the Textile Museum of Canada’s website). Click on a specific culture at the bottom of their page for more info about each one. This wikipedia overview of pre-Columbian cultures in Peru goes back even further in time. Evidence of textiles have been found as far back as some of the earliest “sendentary” cultures in these areas. See full copyright restrictions and permissions at the bottom of the sidebar (if you are on a small screen, the ‘sidebar’ may appear somewhere other than at the side). Photos by others, or of braids made by others, may not be shared in any way without explicit permission from the maker(s). – see full copyright info. Great post, Ingrid. So interesting. Did a five fingerloop flat braid with the split just to be sure I could still do it. Came out fine. Keep inspiring! Hi Connie–Yay! Good for you! And thanks for the note, I’m glad you found it interesting. I’m looking forward to CNCH! Hi Nancy, thanks for reading and for the nice note! You’ve gotten me very curious about Maori techniques!